Our plane left Montreal early in the morning, leaving behind the sleet and snow that had fallen all night. With the regular NHL season rapidly coming to an end, and the playoffs looming, we were definitely ready for spring weather. 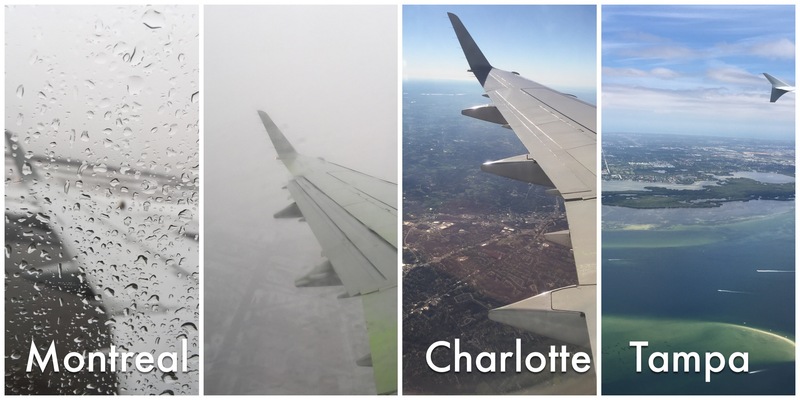 We touched ground in Charlotte, North Carolina’s largest city, and already the scenery was looking better. 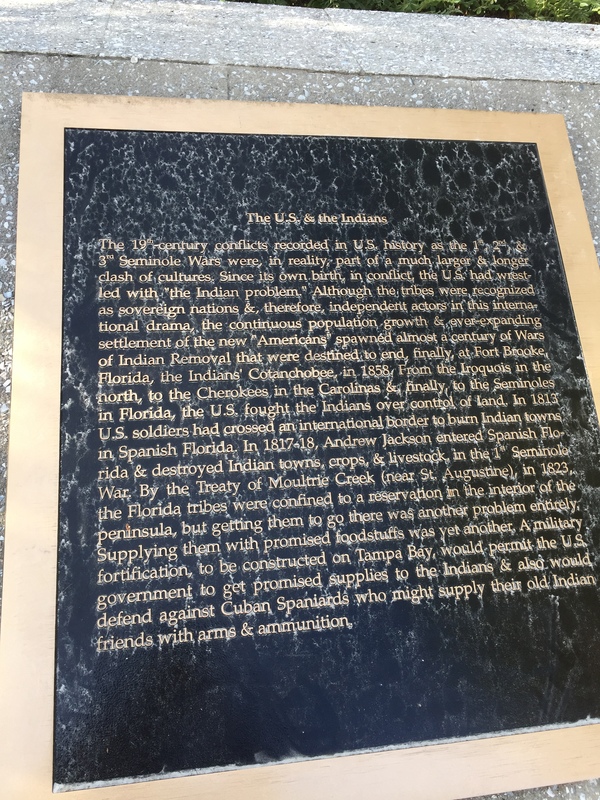 A short connecting flight took us to Florida, where upon exiting the plane in Tampa, the heat hit us briefly, chased by the intense cold of the air conditioning inside the terminal. A few minutes later, the sun welcomed us to what is summer weather for Canadians. This day was already off to a good start. 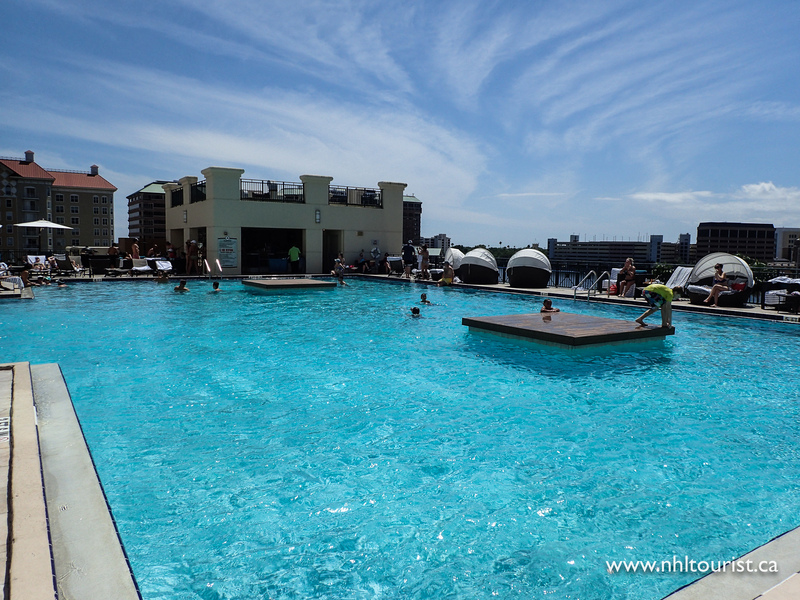 A quick Uber drive brought us to the Marriott Waterside Hotel and Marina, an establishment that sounds better than it actually is, but possessed two essential qualities: it has a nice outdoor pool, and is located across the street from Amalie Arena, home of the Tampa Bay Lightning. After checking in, it was time to hit the pool for some serious recharging. The end of a long winter is always hard on my moral, and getting some sun time, however short, was amazing. The pool deck had a view of the waterway (with a giant ominous “Go Bolts” banner on the other shore) and Amalie Arena on the opposite side. The ambiance was set by a guitarist/singer who played mellow renditions of classic rocks songs, and the barman made excellent margaritas… what a difference from the wet, snowy weather we’d left behind a few hours ago! We could have stayed there until the staff closed the pool, but we had a game to attend! A quick change of clothes and we hit the lobby looking for a place to eat. The concierge was very helpful and we settled on Champions, the hotel’s sports bar. But before we left, she whispered to us “I’m not supposed to tell you, but you might see some players”. So we rushed back to our rooms to put on our Habs jersey, just in case. On our way back, I realized I’d left my autograph kit (index cards and a sharpie) in the room. For some reason I didn’t go back to get it. Why, I don’t know. We lurked around the lobby for a while but didn’t see anyone so we went in and got seated at Champions. Habs colours were everywhere and French was the language of choice at many tables. 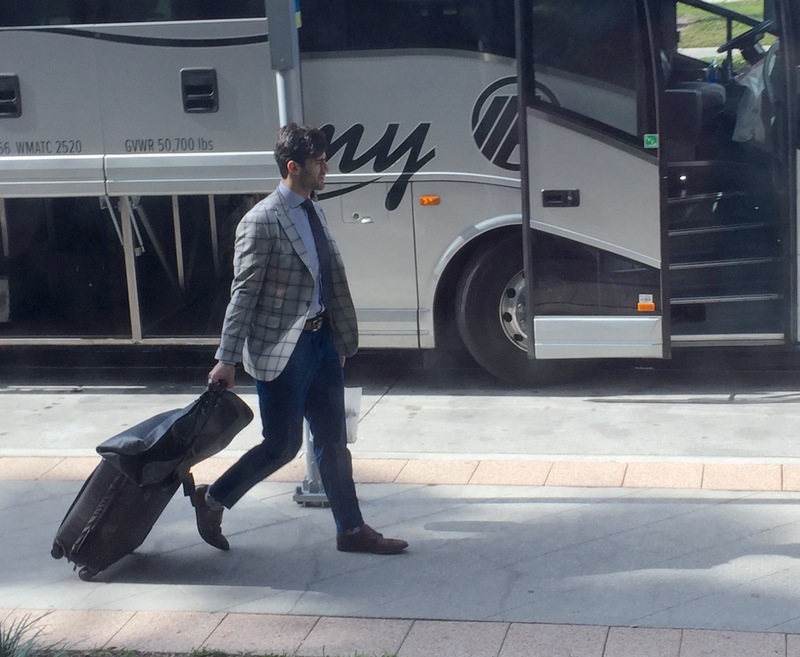 Looking out the window, we saw two busses parked by the curb and soon sharply dressed familiar faces walked by. We’d left too soon! 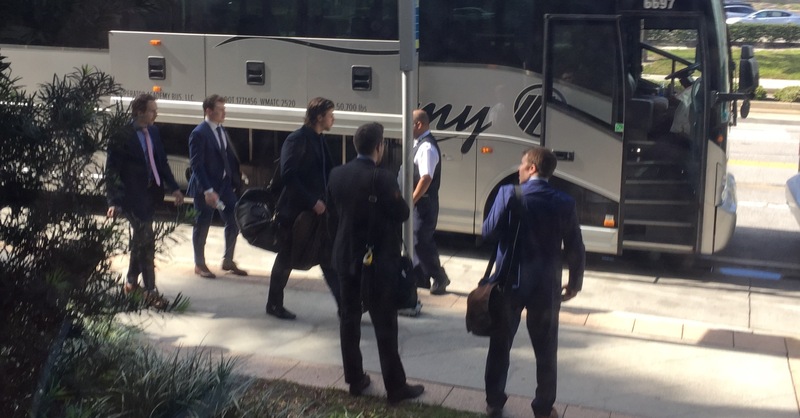 Brendan Gallagher, Nathan Beaulieu and Max Pacioretty all walked by the restaurant window in their way to the bus. What a missed opportunity. You can bet I’ll be better prepared next trip! The food at Champions was really good, much better than your average sports bar. 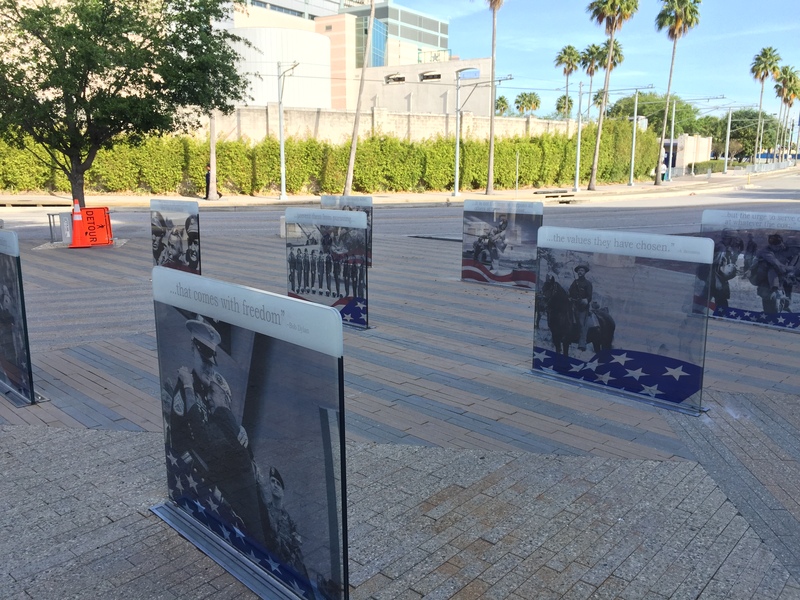 With a bellyful of delicious tacos, we set out to explore the area around the Amalie Arena. 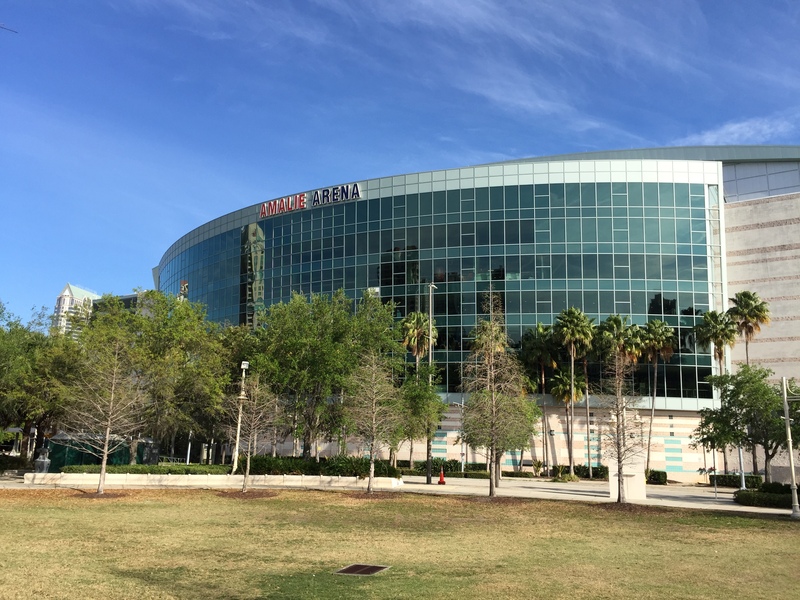 Initially known as the Ice Palace, the building opened in 1996 to serve as home for the Lightning since the area had no building adequate to host an NHL team. 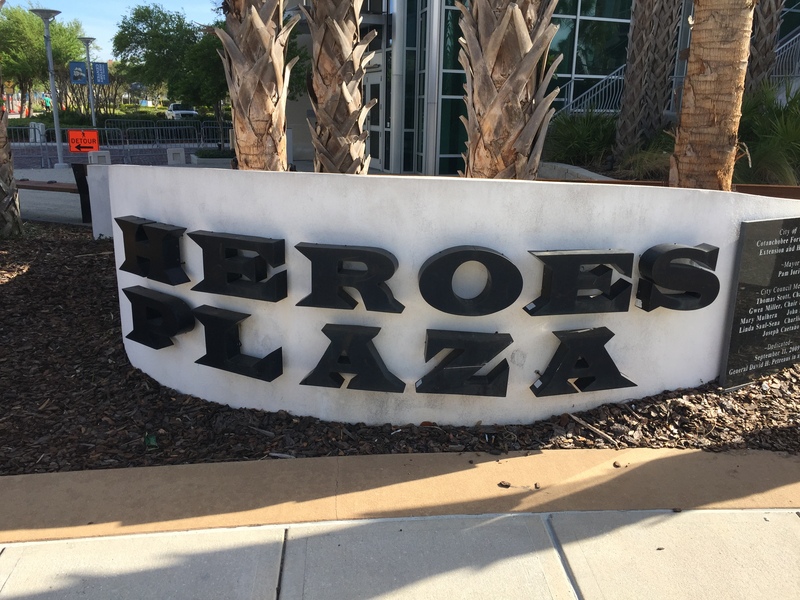 The team had joined the NHL as an expansion team for the 1992-93 season, playing one season at Expo Hall, before moving to Florida Suncoast Dome, now Tropicana Field and the home MLB’s Tampa Bay Rays, until moving into their current home. The area is filled with food trucks and entertainment. Lightning mascot Thunderbug walked around and took pictures with fans (and graciously took one with me despite my wearing enemy colours), and The Thunder Girls, the teams cheerleading team, also made an appearance. 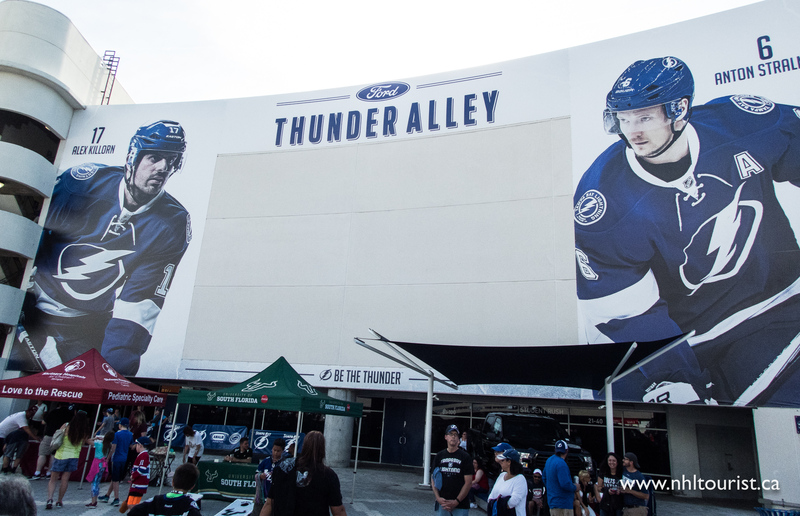 Fans can shop at Tampa Bay Sports for official team merchandise, and the plaza was a sea of blue Lightning jerseys speckled with a fair number of red Canadiens fans. 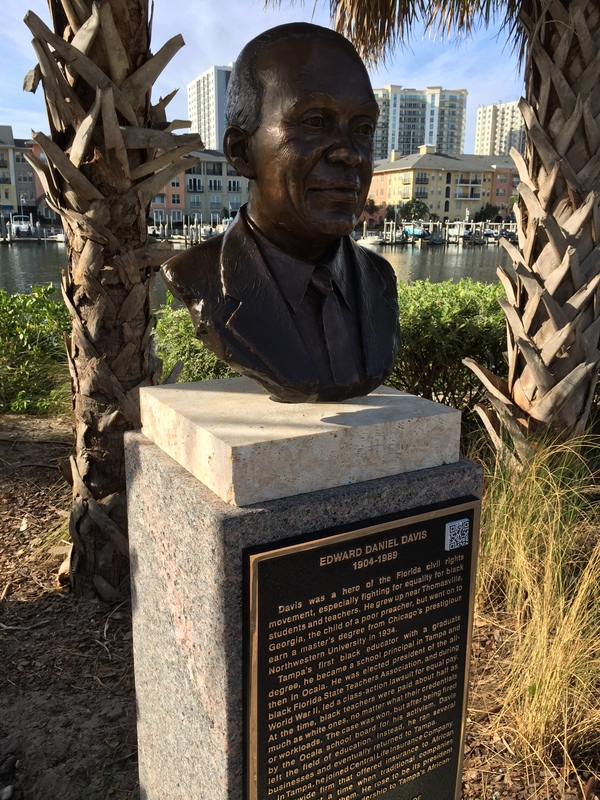 Two statues mark important moments in the team’s history. The Lightning’s first President and General Manager, Hockey Hall of Famer Phil Esposito, stands proudly in front of the main entrance stairs. Esposito, along with his brother Tony, led the group that received the expansion team from the NHL in 1992. A little further away, at the official entrance to Thunder Alley, stands another statue, this one depicting former Lightning captain Dave Andreychuk hoisting the Stanley Cup in 2004. The Andreychuk statue stands 9-feet tall and weighs about 600 pounds, and both works were created by renowned sculptor Steven Dickey. We exited the shop as the doors opened and fans started streaming into the building. Entry was easy and the now ubiquitous NHL-mandated metal detectors didn’t hamper the flow of people coming in. 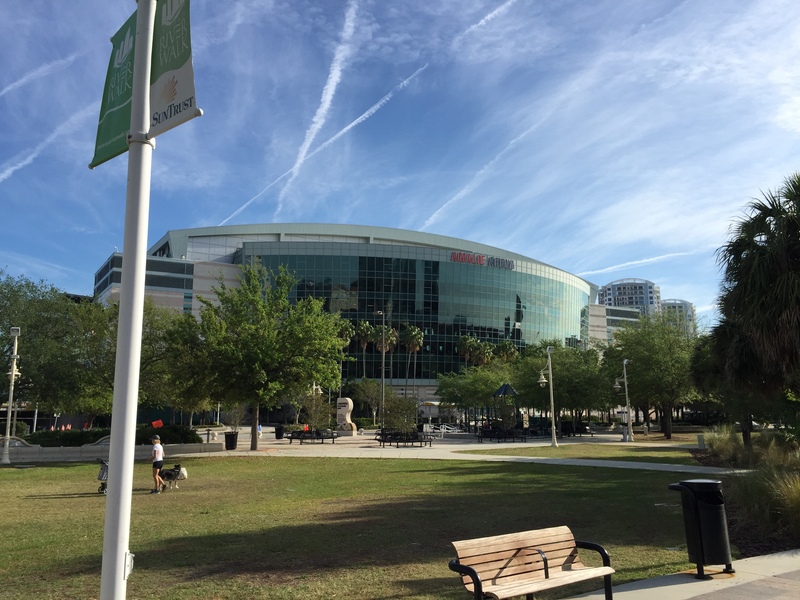 We set off to explore Amalie Arena before it became too crowded. As is becoming the norm around the NHL, restaurant offerings were varied and went above and beyond the traditional arena offerings of hot-dogs, pizza and pretzels. I almost regretted eating beforehand, because the smell coming in from the Holy Hog BBQ was amazing. Seafood, Irish food, and a wide choice of beers were on hand for fans. Those looking for alcohol could stop at World of Beer for a variety of fine brews, wine and cocktails. Prices seemed better than at smaller locations around the arena where a can of domestic beer could run you 14.50$!!!! If Irish fare is your craving, Four Green Fields has your back. Holy Hog BBQ. The smell coming off that restaurant was amazing. 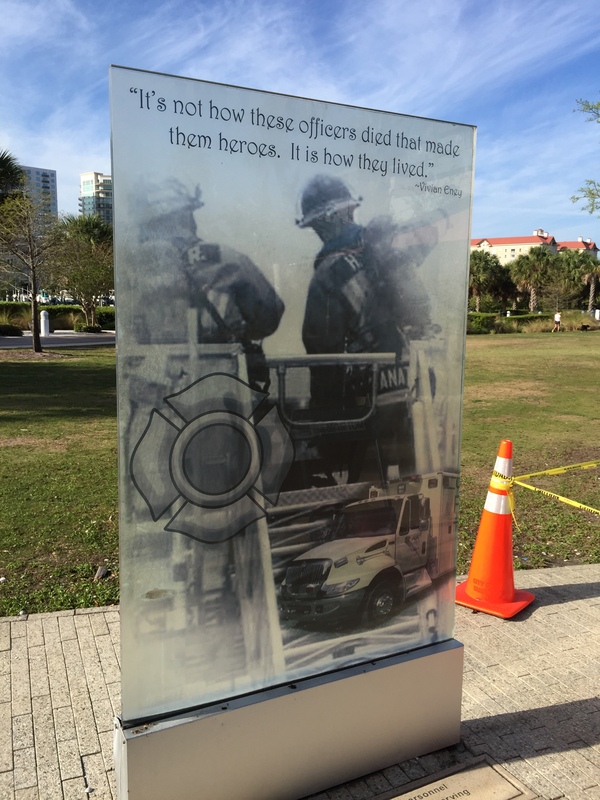 One stand was offering mystery pucks, benefiting the Lightning Foundation, an organisation dedicated to investing its resources and leadership for the enrichment of the people of Tampa Bay, focusing on meeting basic human needs and enhancing lives. 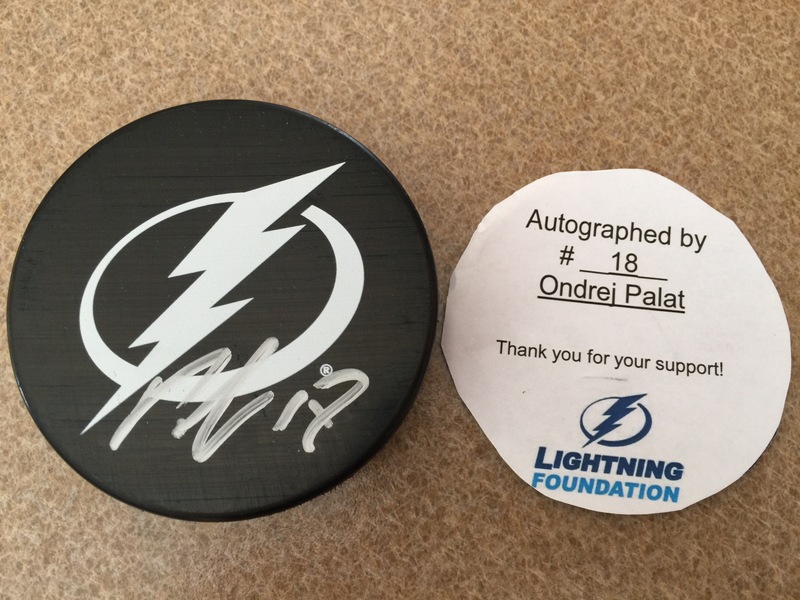 Now I’m a sucker for these things, so I bought one (hey, it’s for a good cause) and got Assistant Captain Ondrej Palat! The autograph is missing a bit of the lower part of the “8”, but it’ll still make a fine addition to my collection. I haven’t had as good luck with the mystery pucks in Montreal! The corridor around Amalie Arena opens right into the arena at multiple points, a feature I really like as it removes a sense of claustrophobia one can get from packed corridors. Walking into the stands, the scoreboard at center ice draws attention right away. 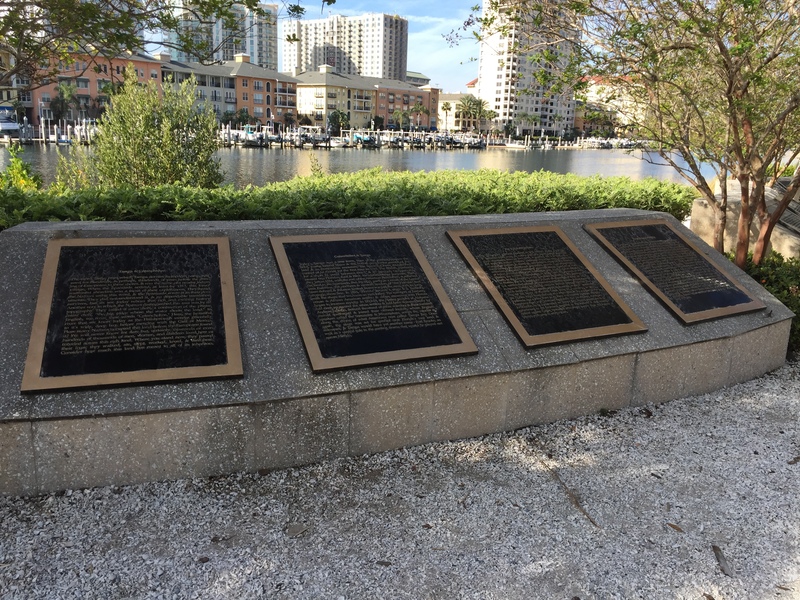 Eschewing the traditional square shape, Tampa’s screen is rectangular with shorter sides at each goal end. Clean graphics and relevant information kept us entertained throughout the evening as the programming focused on stats and player stories. Our seats were located by the Zamboni entrance, on the fifth row. I would later be very thankful for the guard rail next to my seat when a puck rocketed towards me from center ice, zoomed a few inches over the head of a police officer sitting there and hit the rail beside me, ringing it like a bell for a good 20 seconds. That rail saved me from a puck to the ribs or maybe even the crotch! Game programs were handed out to every fan, something I wish we’d have in Montreal. Ironically, center Tomas Plekanec was identified as a “Habs to watch” because of his previous success against the Lightning, even though Habs fans will tell you he hasn’t exactly been our most dangerous player this year (or ever). 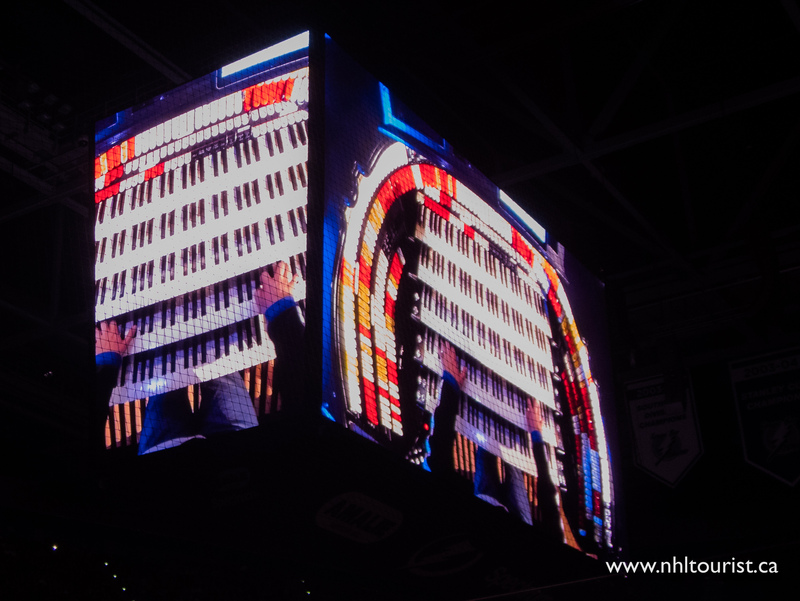 In the upper level, at our end, stands a big platform that houses the arena’s organ player. Lots of classic rock was played, along with the classic arena ditties we’re used to. 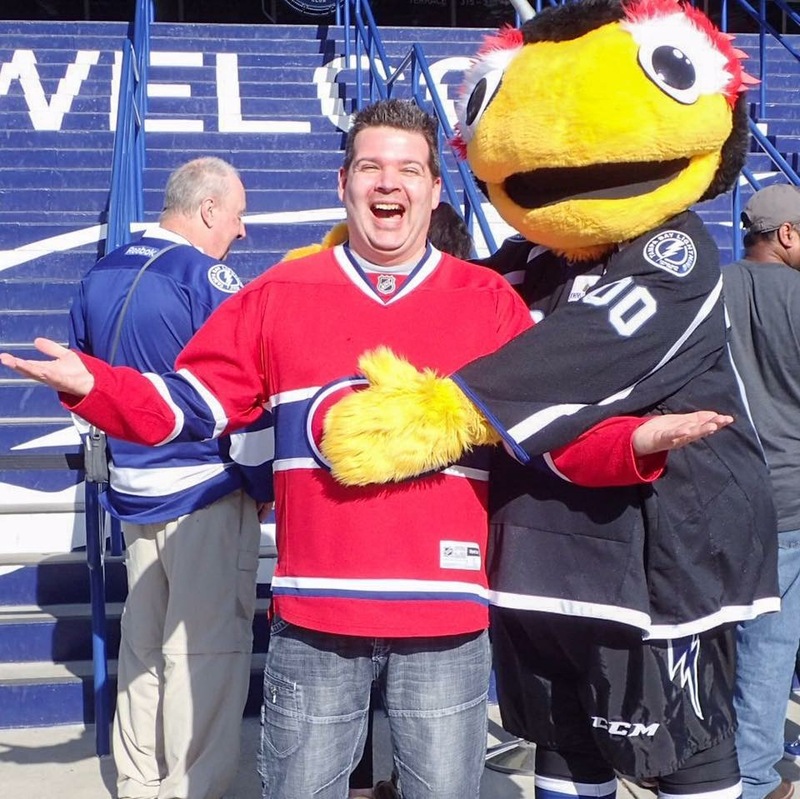 His musical selection was great, and the atmosphere at Amalie Arena owes a lot to his playing. It’s a nice touch on a (sometimes) worn out classic arena element. The Lightning players hit the ice to the sound of AC/DC’s “Thunderstruck”, a great (and obvious) choice to get the sold out crowd pumped up. The sea of blue in the stands was peppered with red Habs jerseys, most of them Canadian snowbirds who seek to escape the winter. The pre-game segment concluded with pleasant interpretations of the national anthems, with Vanessa Rodriguez of Opera Tampa singing “Oh Canada”, and Sonya Bryson, a retired US Air Force Officer, tackling “The Star-Spangled Banner”. The game had much different meanings for both teams. The locals were fighting for a playoff spot, while the Canadiens had already clinched their post-season ticket with a win in their previous game. But they say it’s better to hit the playoff with a winning streak, so the Habs weren’t about to hand out any chances to the Lightning. I know that Lightning fans were disappointed with their team’s effort, but I felt they put pressure on their opponents all night long, despite being outshot by a wide margin. Credit goes to goaltender Andrei Vasilevskiy for making the hard stops and keeping his team in the game. After a scoreless first period, the visiting team got up on the boards with a goal by Philip Danault, on a pass from Captain Max Pacioretty. The Haps kept their lead until the last half of the third period, when Yanni Gourde tied the score, to the fans’ delight. Both team had plenty of chances to take the lead, but the goaltenders were on and stopped everything else. We’d be going to overtime! OT didn’t last long: after 51 seconds, Alexander Radulov beat the Lightning goal tender with a wrist shot for the win. Despite getting a point for the OT loss, this hurt Tampa’s chances of catching up to the last wild card spot. In the end, they ran out of time to make the playoffs. As we were exiting the arena, my phone started buzzing like crazy. 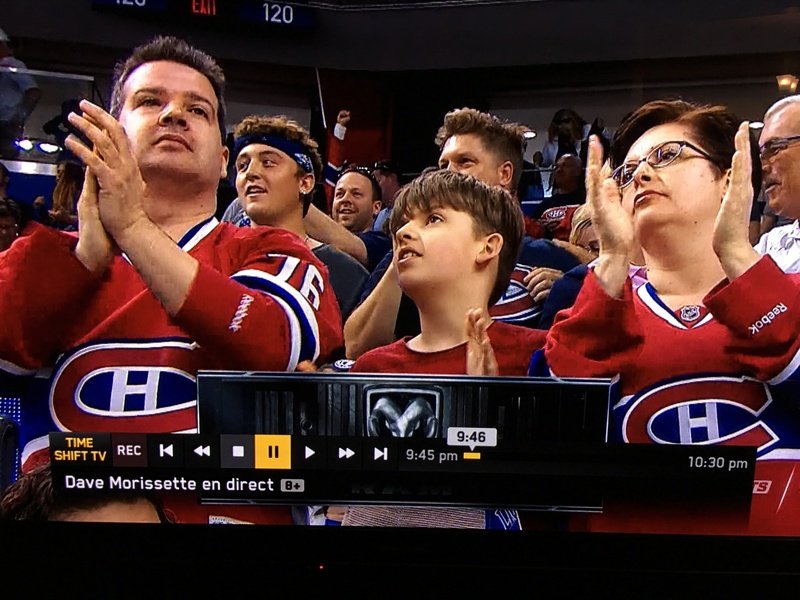 Turns out we showed up on television after the winning goal! Friends, family, co-workers were sending me photos of their TV screens and messages. For a few minutes, we were famous! The worst thing is that we hate that shot. When you’re siting that close to the glass, in a corner to boot, what happens on your side of the ice is lost in a blind spot. 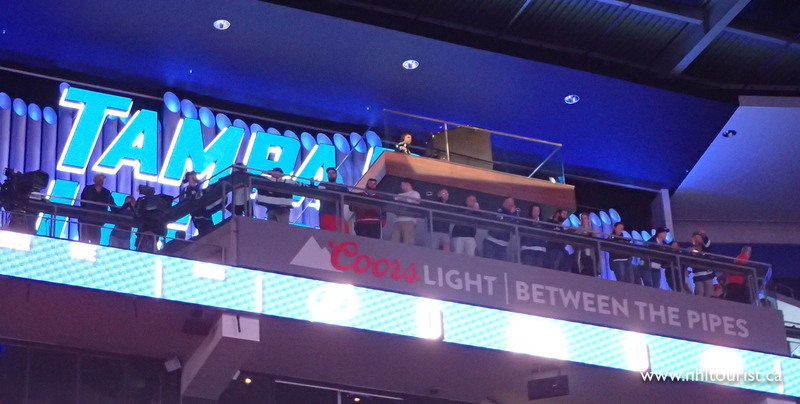 We couldn’t really see the players celebrating so we were waiting for them to move or a replay to come on the screen. That’s why we look so serious! The short walk back to the hotel, in warm weather, was fantastic. I know I said it felt weird to go to the game in shorts, but hey, I could get used to it. Easily. We were in and out for a lightning trip (get it? ), so we didn’t have time to visit the city unfortunately. 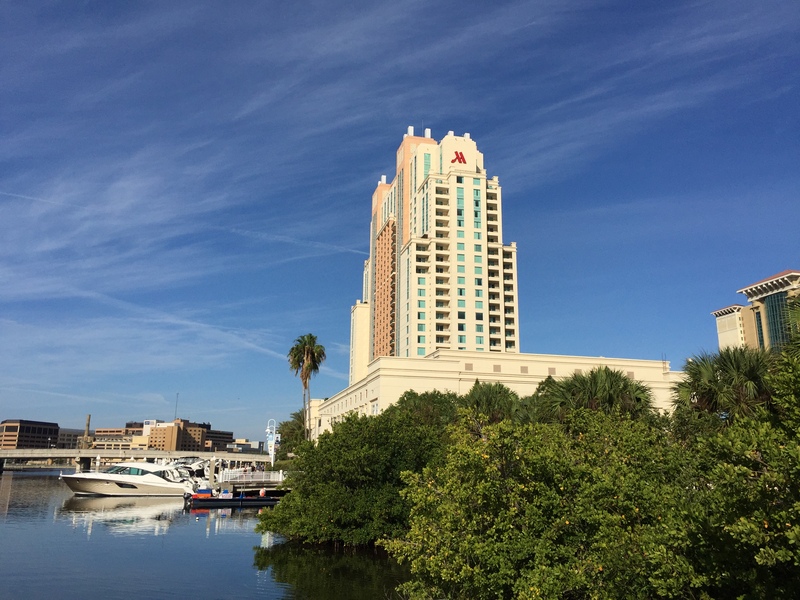 We had a nice breakfast at the hotel cafe, then went for a walk along the waterfront. 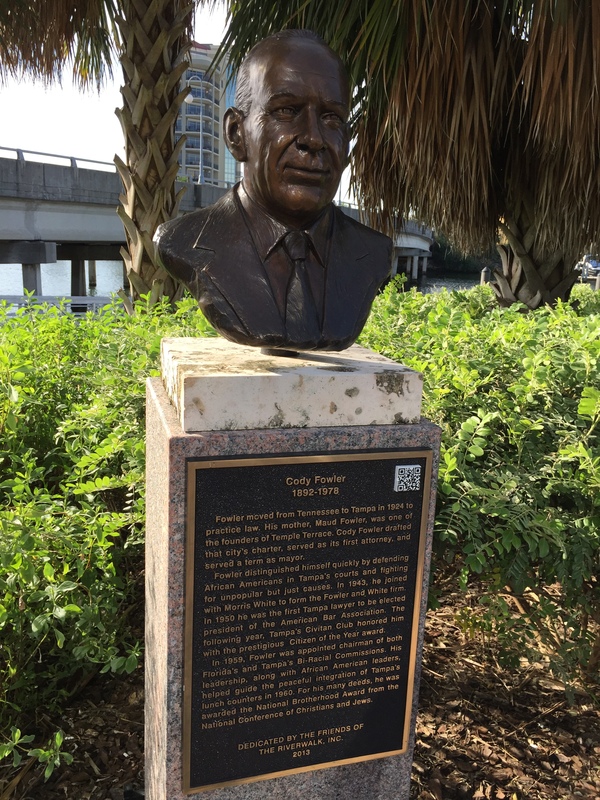 The path features many statues of people linked to the history of Tampa Bay. 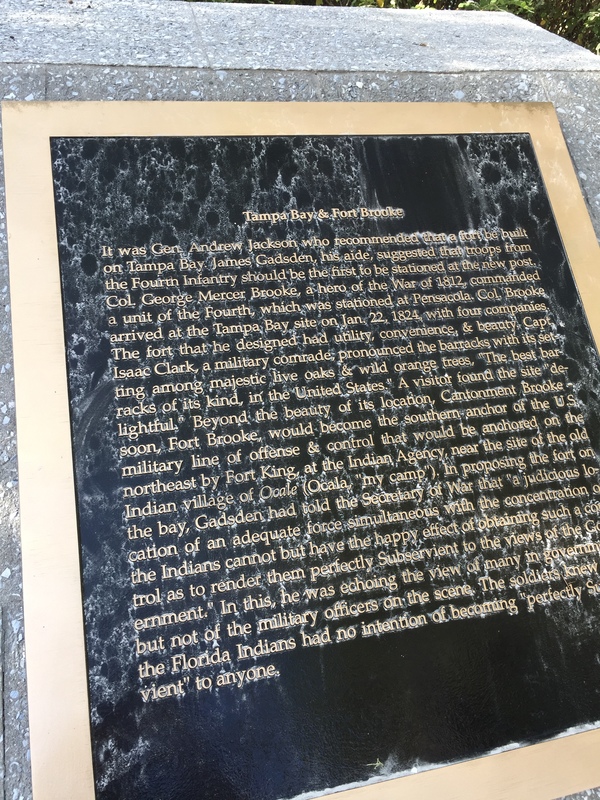 The region was originally settled by Native Americans, who were wiped out by diseases brought by the first European explorers, as well as conflicts with these settlers. 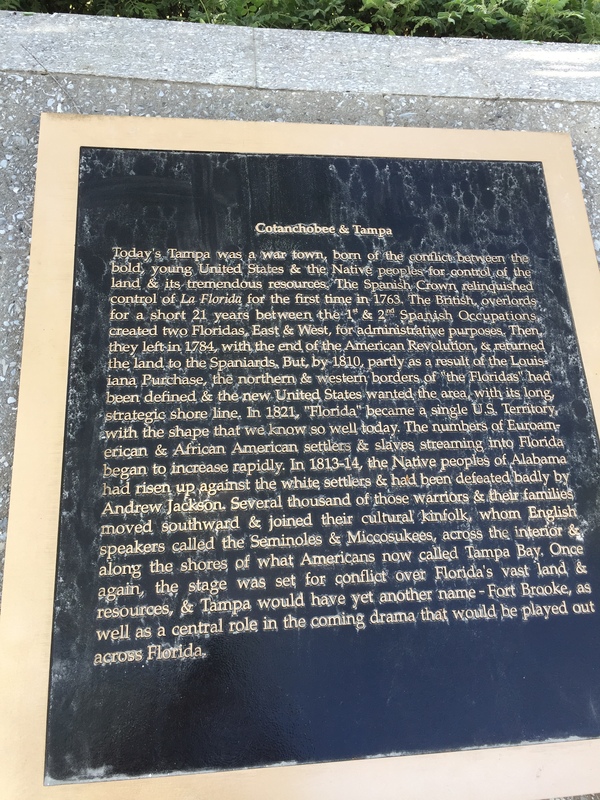 Spain claimed Florida, but never founded a colony in Tampa. 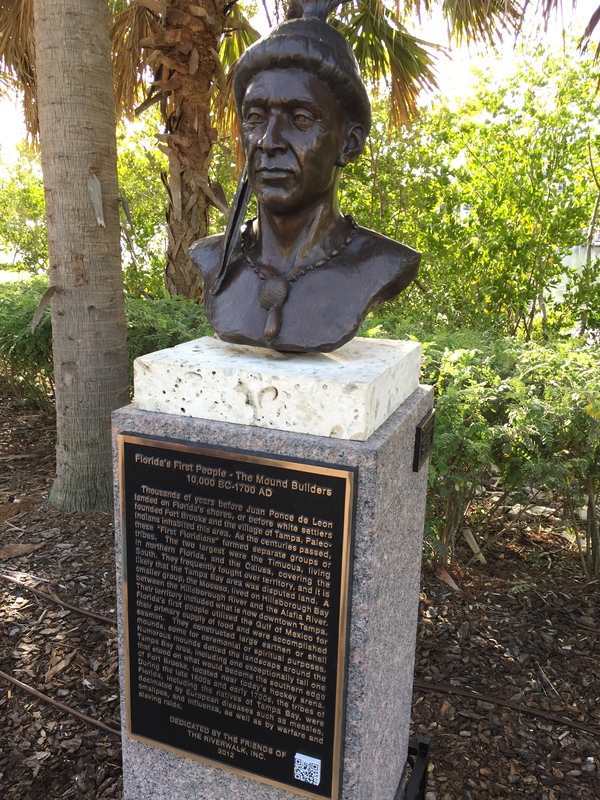 It wasn’t until 1824, five years after the United States acquired Florida, that a first military outpost, called Fort Brooke, appeared. 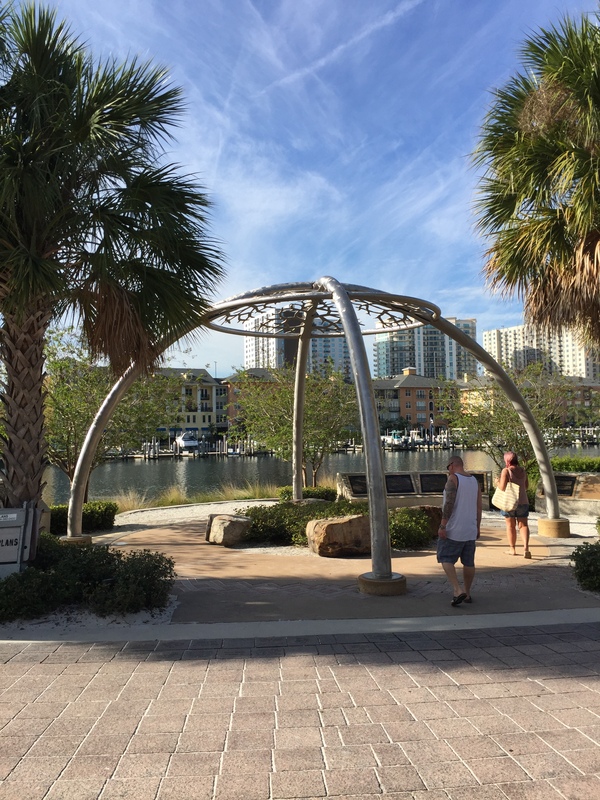 Civilians settled around it for protection, and the village became known as Tampa in 1849. 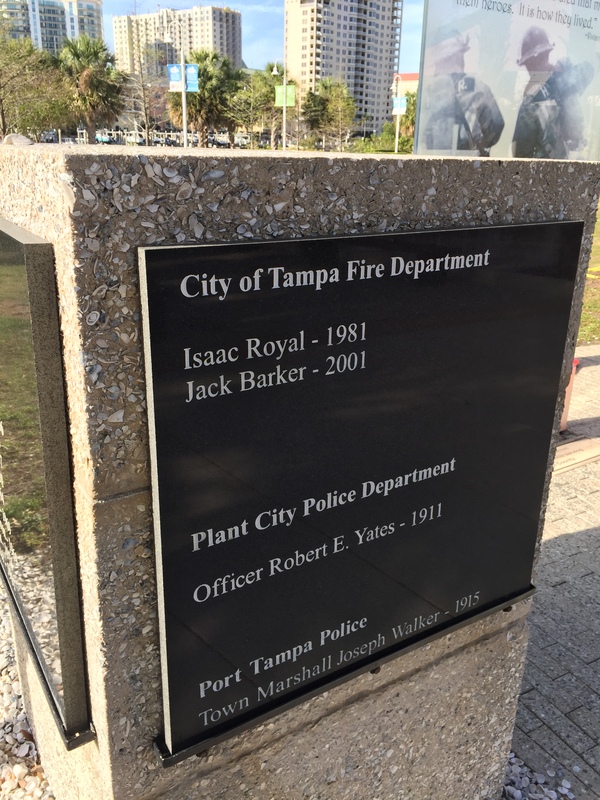 Tampa means “sticks of fire”, in the language of the Natives inhabiting the region, possibly a reference to the frequent lightning the area gets. At the airport, we ate at Columbia, a nice Cuban restaurant. Cuban food is something I only get to sample in Florida, it seems, and I’m always appreciative of its flavours. And that’s not counting the mojitos! Place mats at Columbia, with handy recipes. 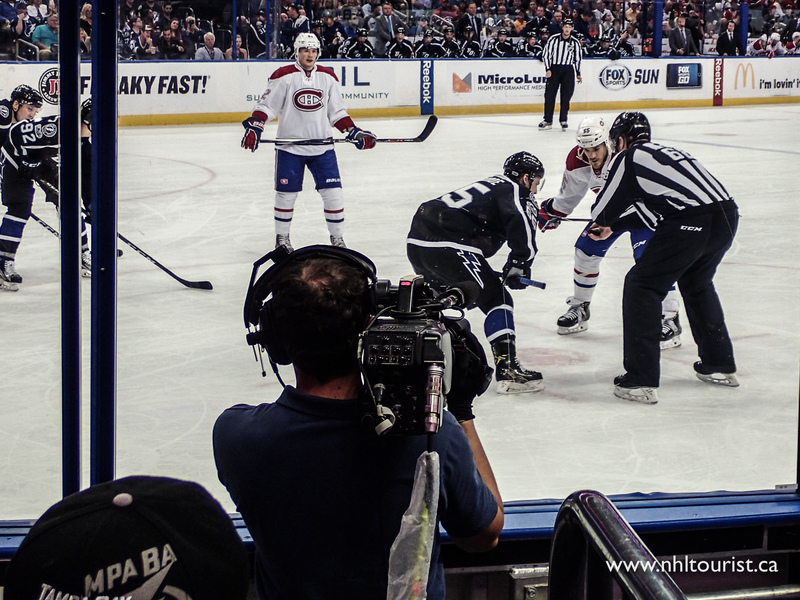 This entry was posted in Games, Photography, Sightseeing, Travel and tagged Amalie Arena, Florida, Lightning, Montreal Canadiens by Jean-Frederic Vachon. Bookmark the permalink.